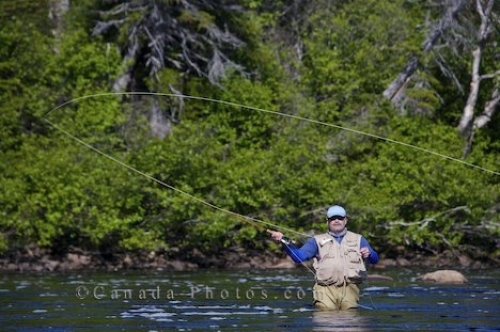 Fly fishing is becoming more popular every day especially in the beautiful rivers that flow through Southern Labrador in Canada. This fisherman dressed in his fishing gear has had lots of practice at casting his line and loves to spend his time standing in the water in hope of a big catch. Fisherman Fly Fishing at White Bear River Falls, Rifflin'Hitch Lodge in Southern Labrador, Labrador, Newfoundland Labrador, Canada. Model Released. Picture of a fisherman waist high in White Bear River Falls in Southern Labrador, Canada casting his fly fishing line.